Did you guys know that Star Wars is a thing? I’m sure you did. I, however, avoided it until I saw Episode VII, and then I wanted to read ALL THE STAR WARS THINGS (I am currently doing a read through of the first trilogy, my first write up is here). Well, I went online shortly after I saw that movie, and discussed my vast ignorance and how I wanted to take care of that problem. I got a ton of reading and watching advice, and a few offers to do various projects. One, however, stuck out to me more than others, so I hitched my star (faded and chipped as it may be) to Shaun Duke’s wagon and I am pleased to announce Thrawn and On and On. Thrawn and On and On will be a monthly (unless that changes) podcast hosted by the Skiffy and Fanty Show. This will be a podcast where a group of us (which I will introduce in a minute) will get together and discuss whichever Star Wars book(s) we have read that month. We are starting with the Thrawn Trilogy, hence the name of this podcast, and will move on from there. Our first day to record is this Sunday, which I hear happens to be some big Sportsball Event. Yay Sportsball! I’m not sure when it will be available to listen to, but I’m guessing not too long after. I will keep you folks updated. There will be four of us podcasting. Here’s a little write up about each of us. Shaun Duke: A graduate student at the University of Florida, Shaun studies science fiction, postcolonialism, posthumanism, and fantasy. He is an avid reader of SF/F, a would-be writer who recently had his first story accepted for publication, and an all around SF/F lunatic. He can be found on his blog, The World in the Satin Bag, and on his Twitter account. Kate Sherrod: Poet (current project: PULP SONNETS! ), fictioneer, podcast crasher, entomophile, practitioner of cultural reportage and stuff. You can learn more about her on her website, and follow her on Twitter. Rachael Acks: Rachael Acks is a writer, geologist, and sharp-dressed sir. In addition to her steampunk novella series, she’s had short stories in Strange Horizons, Lightspeed, Daily Science Fiction, Shimmer, and more. She’s an active member of SFWA, the Northern Colorado Writer’s Workshop, andCodex. You can learn more about her on her website, and follow her on Twitter. Admittedly everyone participating in this event knows more than I do, so that should be interesting. I’m already really enjoying reading the Star Wars books (though I will admit that the Thrawn stuff is holding my interest a LOT more than Attack of the Clones is. I’m struggling quite a bit with that book.) Regardless, this podcast will be a ton of fun, and I think it will really up my enjoyment of immersing myself in the Star Wars experience if I’m doing it with others. So that’s that. Thrawn and On and On is a thing that is happening. I’m incredibly excited about this podcast, so I hope those of you who feel so inclined will take a listen when it’s live, and check for regular updates here. 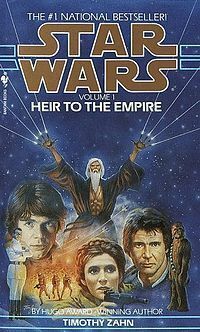 The Thrawn series is the best of all EU books, but you really need to read the Jedi Academy trilogy first, since the events follow it as direct consequences.